The Digital Media Machine: Do people judge an ebook by its cover? Do people judge an ebook by its cover? 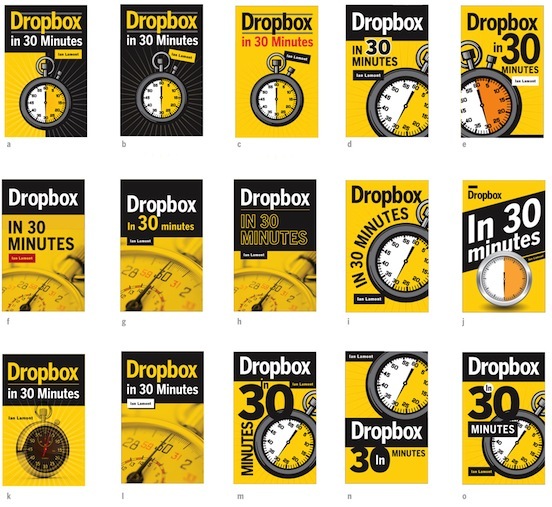 Last month, I conducted an experiment with my first ebook, a Dropbox for Dummies alternative. I wanted to measure the impact of getting a professional cover design. Was it worth the extra cost to hire a pro, or is a DIY cover good enough for a niche topic? I tried both approaches, and in this post, I'll show the designs I used and the sales data for the DIY vs. professional cover designs. The story starts in June, when I began writing my first ebook title. 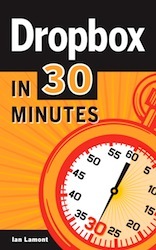 I published Dropbox In 30 Minutes on July 8 in the Kindle store, BarnesAndNoble.com, and as a PDF. Except for external review, it was a completely do-it-yourself effort. Writing, formatting, file conversions, marketing and cover design were handled by myself. During the production process, I was mildly surprised to discover that most self-publishing platforms aren't picky about design standards. For instance, as long as you submit files that meet the required pixel counts, Kindle Direct Publishing generally doesn't care what you put on the cover. This was perfect for my early ebook experiments. Not only did I not have any cash to spare, I also wanted to have a complete understanding of the processes involved in ebook production, including those that are outside of my area of expertise, such as cover design. Make the text crisp and clear. Remember, your cover will be shrunk to the thumbnail size, so you want all the cover elements to look good in a small image. This means, if you make your title or author name too small on the cover, it’ll be invisible in the thumbnail. Clearly, strong colors are key. They are far more likely to be noticed than bland or grayscale cover designs, especially when it's listed in thumbnail form with a bunch of other covers (for example, in Amazon search results). As I look at it now, I have to cringe. It's not only bad, it's laughable. But it did the job: It clearly communicated what the ebook is about, even at thumbnail scale. I later replaced the green color with red, but all of the other elements stayed the same. By the end of July, I had sold about two dozen books, or roughly one per day. Most of my sales were through Amazon. By this point, I was already spending a lot of time on DIY marketing, including the book website, which prominently featured the DIY cover image. I had also optimized the Amazon title, description and keywords, which were important to how the book ranked in Amazon's search engine. But as July turned to August, I began to wonder: Was my DIY cover hurting me? I looked at the signatures on the KBoards author community, and could see that other self-published authors were spending money on pro covers ... and the covers looked really good (you can see a few examples on the author signatures on this KB forum page). In a perfect authors' world, good content alone would drive sales and people wouldn't judge books by their covers. But in the real world ... they usually do judge books by their covers. For fiction books, eye-catching characters and evocative scenes can capture readers' attention. For non-fiction or educational titles, the qualities that tend to matter are "informative" and "professional". The design should be simple, particularly for the ebook covers -- large fonts and large design elements as the images will frequently be viewed in thumbnail size (105x160 and 48x70, see http://amzn.to/RpCRmm for examples). The PDF cover can be a little more detailed, but this will also be used as a thumbnail in the advertisements I am preparing for it. Please try to use public domain or art that won’t come with any copyright, license, or trademark restrictions. 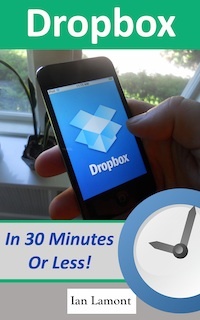 For this reason, I don’t want to use Google or Dropbox logos on the cover. 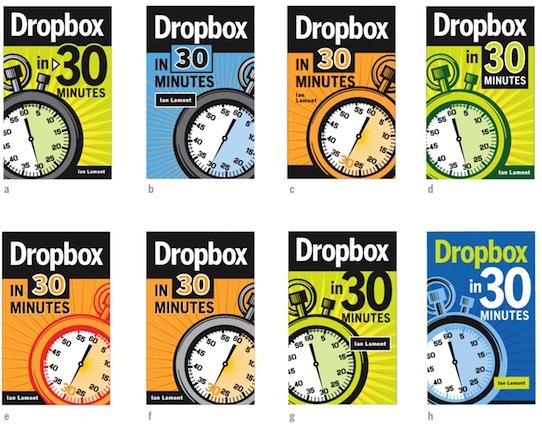 “In 30 Minutes” ebook covers - Should use a clock icon or illustration. In other words, sales averaged two per day with the DIY cover, vs. three per day with the pro cover. In addition, during the second period, the book broke the top 25,000 "paid in Kindle store" ranking for the first time ever, and Amazon search ranking for "Dropbox" in "All categories" rose from #5 to #3. While increased sales pushed ranking up, the rise could have been affected by the declining sales of other titles. And, for what it's worth, sales have since slowed, along with ranking. Search ranking could have also been impacted by the withdrawal of other titles from Amazon's product catalogue. Going forward, I am going to be using Steve's services for my other books. His rates are reasonable, and I really believe in the long run professional cover designs will help sell more books. It also takes a time-consuming task (fiddling with GIMP) off of my plate, which allows me to concentrate on writing and marketing my books. Nice write up - I love the covers done. Can you share with us the design costs? Anonymous: I don't think Steve of Single Fin Design would like to have the exact details put out in a public forum (he works with professional publishing clients, too). However, I will say he charged an hourly rate that I thought was very reasonable, and when compared with the flat fees I see other designers using, it's absolutely competitive. These two covers (besides the Dropbox cover, I used him create a variation for "Google Drive & Docs In 30 Minutes") took about four hours. In addition, I asked for some significant changes based on the first set of yellow designs, which probably added an extra hour.